Energy giant BP is moving beyond petroleum and focusing on new sources of power for the future, with major commitmentsin hydrogen and solar. As the North American energy industry heads into the summer of 2006, there is more than a bit of trepidation. It was a year ago that Hurricane Katrina struck the north-central Gulf Coast of the United States and left oil prices spiraling upwards in its wake. Since then, oil prices have remained within a narrow higher historical range. But with predictions of tight markets, some industry analysts are coming up with extremely aggressive forecasts, saying prices could surpass the $100 a barrel mark. Although critics viewed these predictions with skepticism, oil prices could eclipse the lofty levels the industry has seen in the last year if there is any disruption in supply. And that could happen--there have been forecasts for an above normal hurricane season. High energy prices have been reflected in hefty profits at the major multinational oil companies. Royal Dutch Shell, Exxon Mobil and BP all saw significant double digit jumps in profits. They have, it would seem, an embarrassment of riches. While some energy companies have chosen to take the increased profits and embark in takeovers or investments in further traditional energy exploration projects in recent years, a hardy few are thinking outside of the traditional energy box, and investing in alternative energy. BP is a case in point. Transit users in London and other European cities are part of a pilot hydrogen demonstration project--which BP is involved in--that could make hydrogen more available in both Britain and in Europe. Under the program, which is currently the largest hydrogen bus trial in the world, BP provides for London buses at its retail site in Hornchurch. Following the success of the trial in London and other cities, the European Union has agreed to partially fund the program for another 12 months, with seven cities taking part in the extension. The Hornchurch station is the first in the UK and Europe to use underground storage of liquid hydrogen for transportation purposes--a method that has been successfully used for industrial purposes for many years. Meanwhile, in North America, BP and Edison Mission Group, a subsidiary of Edison International, have announced that they are planning a new $1 billion hydrogen-fueled power plant in California that would generate clean electricity with minimal carbon dioxide (CO2) emissions. The plant, said to be the first-of-its-kind, would be located alongside BP's Carson refinery, about 20 miles south of Los Angeles, and would be capable of producing 500 megawatts (MW) of low-carbon generation, enough power to serve 325,000 Southern California homes. BP and EMG hope to bring the new power plant online by 2011. These projects are just the latest signs of how BP, one of the largest energy companies in the world, is working to live up to its recently introduced motto, and that it is now thinking "Beyond Petroleum". 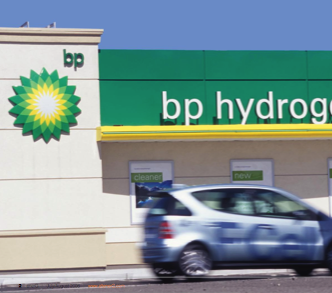 These announcements follow the November 2005 launch of BP's new low-carbon power generation business--BP Alternative Energy--which is bringing together hydrogen power projects with BP's interests in solar, wind and gas-fired power generation. BP plans to invest up to $8 billion over the next ten years to create a low-carbon power business with the potential to deliver revenues of around $6 billion a year. Clearly, additional power sources are going to be needed. 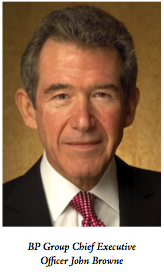 In a speech to the Brookings Institution, BP Group Chief Executive John Browne outlined the staggering growing world-wide needs for energy. "Demand now is nearly 50 percent higher than it was only 20 years ago," said Browne, noting that the world's population increases by almost 10,000 each and every hour of every single day. By some estimates, there are perhaps 200 million new customers for commercial energy every year, he said. Concerns about climate change and stability of supply also need to be factored in. "We have to look ahead and invest to meet the needs of tomorrow--the needs of a rapidly changing, growing global energy market and the needs of a world where climate change will be a constant preoccupation. "We want to give people choices--including the choice of new alternative energies which are available at a reasonable cost, which don't lead to even further dependence on a small number of sources of supply, and which are positive for the environment--producing less carbon, and therefore reducing the risk of global warming." "And that is what we plan to do--by launching a new business. BP Alternative Energy." This new business will bring together and build upon the work BP has already been doing on alternatives and renewables Browne said. BP Alternative Energy will include work on solar power, where the company has built a business over the last thirty years "which is now one of the leaders in the industry". "Eight years ago we said 'We want to transfer our distinctive technologies into production, to increase manufacturing capacity and to position the business to reach $1 billion in sales over the next decade.' We are on track to do that. "The new business will also include work on wind power, where we have begun with a series of wind farms on our own land. It will include work on combined cycle gas turbines, and cogeneration technology. And work on the new and rapidly evolving technology of sequestration--taking carbon out of hydrocarbons, and using the hydrogen to develop a carbon free source of electric power." Vivienne Cox, BP's Chief Executive for Gas, Power and Renewables, and Integrated Supply and Trading, also outlined the new venture. Cox said that BP Alternative Energy will be a different kind of business, perhaps the first of its kind. "I say that because BP Alternative Energy will be the world's first business dedicated to the development and wholesale marketing and trading of low carbon power. "And it's going to look a little different too. A little unusual for BP. You might say a little 'alternative' for a major energy company which has a hundred years of tradition behind it. We would say it's another important step 'beyond' for a progressive company that has a keen eye on the future of energy provision." The new business is being called "BP Alternative Energy" for a very good reason, Cox explained. "We believe it will offer a real alternative to the world in the generation of power with low carbon emissions." And what does the company mean by a low carbon power business? "What we mean is a profitable business using the cleanest, greenest ways we have of generating electricity, the ways that emit the least carbon. That includes solar and wind--renewable energies which have zero emissions of carbon." All this begs the question of why now for BP Alternative Energy? Part of the answer lies in the growing difficulty in finding--let alone gaining access to--new sources of traditional energy. On top of that is the growing enviromental awareness. "We know that consumers are increasingly engaged in the environmental debate and many countries are concerned about energy security," says Cox. "So demand for cleaner electricity is out there. These technologies have matured and are increasingly competitive which means there's a significant opportunity to make good returns. They provide a pragmatic mix of new and established technologies and offer great potential for further development in driving efficiencies and lowering costs. BP has distinctive capabilities in each technology which it believes the company can take advantage of. They have built up their solar manufacturing and marketing capabilities into a profitable and growing business, and also have proven experience in developing successful wind farms operational sites. Third, demand for power from these technologies is growing very fast. "All this leads us to the conclusion that the low carbon power sector is reaching a critical inflection point," says Cox. "We believe we have an opportunity to create a high-growth, world-scale business in low carbon power over the coming decade, and we're hoping that by leading the way we will encourage others to follow." Company executives realize such lofty goals involve, as Cox puts it, "a long-term journey". All the more reason for the company having clear aspirations over the next 10 years and some very specific ones for the next three, she added. The company will be spending the announced $8 billion in different alternative technologies--it says the precise mix will depend on the market and the way in which technology develops. But within 10 years, they are aiming to grow the business substantially, five to 10 fold. "This would create a new low-carbon power business with the growth potential to deliver revenues of around $6 billion a year within the next decade"
Over the next three years, the company will be making an investment of $1.8 billion which will establish a business, balanced roughly equally between the four elements of solar, wind, gas power and hydrogen power. "Over those three years we'll take these products to the market--giving states, local utility commissions, and businesses a greater choice on how carbon intensive their electricity generation will be," says Cox. In those three years, the company aims to grow BP's wind business from 30MW to more than 450MW. They're planning on building two of the world's first commercial hydrogen power and carbon sequestration projects beginning in 2006 and 2007 "And we plan to increase sales of solar photovoltaic panels by at least three times from their current base of 110MW." The prospects for solar power, said Cox, have never been better. "The market is growing at 30 per cent per year. Costs of the technology continue to trend downwards. In our view, it is increasingly a matter of how soon--and not if--solar becomes grid competitive in many markets." BP makes around 100MW of solar panels worldwide and they are currently in the process of doubling that capacity to 200MW. They currently have manufacturing plants in the U.S., Spain, India and Australia. As part of Alternative Energy, the company is expanding solar manufacturing capacity by 45 MW at the plants in India and Spain. This comes on top of ongoing expansion of plants in Australia and Spain which are adding 40 MW of capacity, and expanded manufacturing capacity at the plant in Frederick, Maryland. When complete, these steps will double BP's global solar manufacturing capacity. BP is starting to extend the global reach of this fast growing business into new markets such as China where they have formed a joint venture with Sun-Oasis, providing access to the world's largest fast growing market. This growth plan will position BP Alternative Energy as one of the world's top three solar manufacturers and marketers. "We aim to be a leader in the solar industry in the drive to reduce the total installed costs of providing solar energy to levels at which it can compete strongly with oil, gas, coal and nuclear in the generation of electricity--something that is possible today in some markets," said Cox. This is possible through continued innovation and technology gains across the solar value chain, including lower cost panels, higher efficiency cells, and more productive 'total system' installations. Over the next five years, the company sees another 30 to 40 percent total system cost per watt improvement which will close the 'grid parity' gap considerably in many markets, said Cox. The potential of wind power is also very significant, noted Cox, with an annual growth rate of 12 per cent. During the next fifteen years, wind power capacity globally is projected to quadruple to over 200GW. In terms of wind, BP is currently a relatively small player, with two wind farms in the Netherlands sited at the Nerefco Refinery, with a total of 22MW capacity, and at a BP Amsterdam terminal, with a capacity of 9MW. A similar scale project is being brought forward in the UK. These farms, though, have some of the largest wind turbines in Europe and have enabled BP to gain an understanding of the technology and economics of wind power, said Cox. "In particular we have learned how to build wind farms in challenging conditions presented by industrial sites. And this is where our focus and distinctiveness will be as we scale up our investments in wind. Large scale farms on brownfield sites--largely but not exclusively on BP real estate." The company announced its intention to enter the US wind sector with the first large site being commissioned during 2007. "We plan to grow our wind business from our current base of 30MW to more than 450MW in 2008, becoming a top tier wind power operator by 2015." The company also has plans for the world's first commercial hydrogen power stations. The first, in Scotland, calls for taking natural gas from North Sea fields and converting it to hydrogen and carbon dioxide. The hydrogen would be used as fuel in Scotland's Peterhead power station while the carbon dioxide would be injected more than three kilometres under the seabed into the Miller Field reservoir. The power station is being designed to create 350 megawatts of virtually carbon-free electricity, enough to power up to half a million homes in the UK. It is exploring a second hydrogen power project in the United States that could use petroleum coke--a refinery byproduct also known as synthetic coal. Not only would the plant produce low-carbon power, it could also help produce additional US domestic oil that would have otherwise been unrecoverable. Cox said the company believes the economy of the future will be a low carbon economy. "With the launch of BP Alternative Energy, we're putting a marker in the ground saying that we plan to play a big part in that economy and in that future."